It turns out that wild turkeys are incredibly difficult to move across long distances. In the days before refrigerated travel, a national roadway system, and even railroads, driving turkeys across long stretches of land was the province of men called turkey drovers. 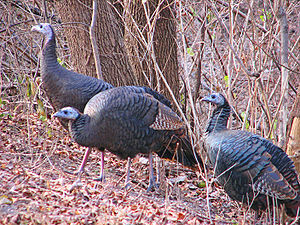 From 1790 to about 1830, turkey drovers walked turkeys to market, literally, at a top speed of about one mile per hour. In Massachusetts, this meant driving, or walking, a flock of turkeys from Central Massachusetts to the meat market in Brighton, just outside of Boston. Each fall during the nation’s first decades, turkey drovers could be seen driving their turkeys across the lesser travelled byways of New England; the horse traffic of the day apparently proved a worthy distraction that slowed the driving of the turkeys even more. Turkey driving was a dawn-to-dusk activity. At the first sign of darkness, turkeys bolt for trees, ascend into them, and roost for the night. For this reason, turkey drovers, usually travelled in covered wagons and took turns protecting the roosting turkeys from predators (both animal fauna and humans) as well as from simply wandering off. Another peril in turkey driving: turkeys tend to crowd together when being driven and will trample each other. To overcome this, men called shooers divided the turkeys into lots of up to 75 birds, and led the turkeys along their route using a long pole, with a piece of red flannel attached to the end. So, when picturing the Thanksgiving Days of yore during this year’s holiday season, add the turkey drover and his large flock of turkeys to your conjured images. Happy Thanksgiving, readers!